Spring Guessing Games: Who? and What? 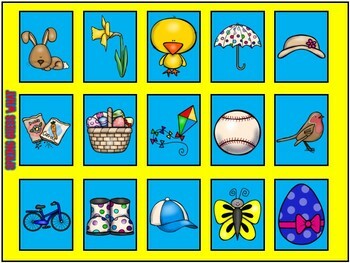 Please enjoy this fun freebie to target listening comprehension with a Spring theme! 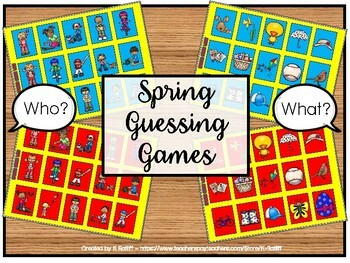 These two games are played in the spirit of the popular Guess Who and Guess What games. 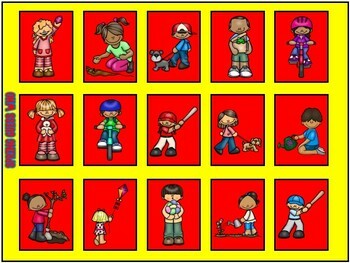 Rather than folding down doors (like the commercial game), these games are played by simply covering the eliminated item/character with a coin or bingo chip. 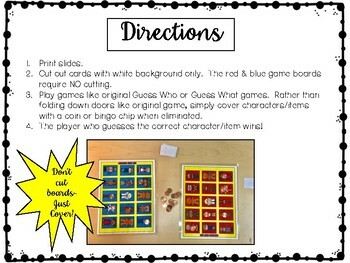 Decide which game to play (Who or What) and give game boards to the two players. Each player chooses a card (without showing anyone) indicating their character or item. Players ask yes/no questions to narrow down choices and guess the other player's item/character. If playing Who, questions might be, "Is your character a boy? ", "Is your character wearing something on his head?" If playing What, questions might be, "Is your item an animal? ", "Does your item have polka dots?" Lots of skills can be targeted, and games are always a hit! Happy Spring! Enjoy the freebie! Please visit my store, https://www.teacherspayteachers.com/Store/K-Ratliff, for more fun listening and language activities!